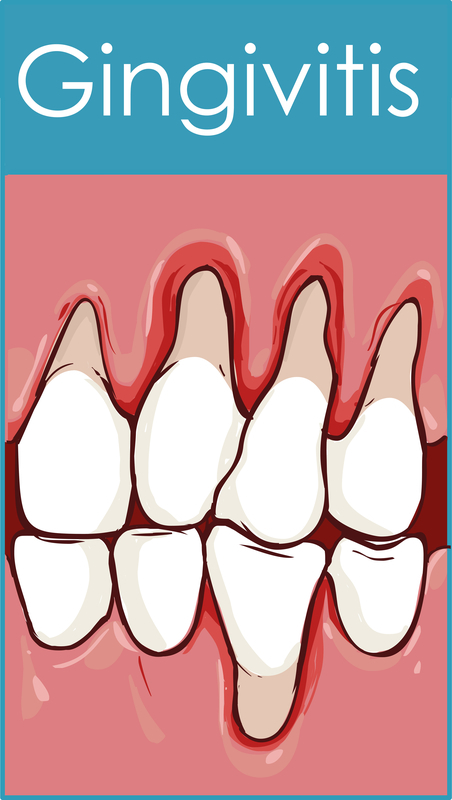 Left untreated, gingivitis will grow into serious infections that cause tooth loss and even heart failure. Gingivitis can lead to periodontitis, which is a serious bacterial gum disease that results in jaw-bone loss and loose and lost teeth. Gingivitis is an inflammation of the gums (gums are called “gingiva” and “itis” means inflammation). It is caused by bacteria. If you have gingivitis, your gums are likely red and swollen. They may bleed when you brush your teeth. Sometimes gums with gingivitis will be sore. Some people have gingivitis and don’t even realize it, although they may notice a receding gum line. Friends of a person with gingivitis might be aware, however, as gingivitis can cause bad breath, too. Anything that irritates the gums—dentures, bad-fitting dental appliances, bacteria, plaque, trapped food, smoking—can result in gingivitis. Crooked teeth with uneven gaps can set the stage for gingivitis, allowing debris to become lodged between teeth, irritating the gums. Not brushing regularly, avoiding dental floss, and skipping your dentist appointments are all gingivitis friendly. Your risk for developing gingivitis increases as you age and with poor health. The American Dental Association’s MouthHealthy.org lists pregnancy and diabetes as risk factors for gingivitis. A poor diet increases your risk of getting gingivitis, as it depletes your natural immune-system defenses. For example, Medical News Today says a vitamin C deficiency can lead to gingivitis. Can Medications Lead to Gingivitis? Some medicines, like steroids and birth-control pills, can predispose you to gingivitis, as can any medication that causes a dry mouth. You may also have a genetic tendency to develop gingivitis. Dentists have found it runs in families. Early gingivitis is not a major problem, but you need to notice it right away. Unchecked, it can cause a gum abscess or trench mouth. It’s even powerful enough to begin to separate teeth from the gum. This can lead to periodontitis, which is a serious bacterial gum disease that results in jaw-bone loss and loose and lost teeth. Periodontitis has also been linked to illnesses like heart disease, as the bacteria can get into the bloodstream and travel through the body. You want to avoid periodontitis, which can require invasive, painful, costly dental procedures, such as root planing, scaling, and root-surface debridement. The American Academy of Periodontology says approximately 64.7 million Americans have periodontitis. Your dentist will make a diagnosis of periodontitis vs. gingivitis by looking at your teeth and charting gum-pocket depths. “There are other tests currently available that go beyond basic and subjective visual assessment to provide dental professionals with the detailed genetic and biological information required to better determine the appropriate treatment regimen for each individual patient. This information includes evaluating the inflammatory burden that is causing periodontal disease, as well as looking at the patient’s unique genetic susceptibility to periodontal disease,” says perio.org. You can reverse gingivitis right at home, if you catch it early enough. A saltwater rinse can help soothe and heal the gums. Regular brushing, which means twice a day, is the first step (Medical News Today suggests using an electric tooth brush). You’ll need to add regular dental flossing and the use of a good antiseptic mouthwash to eliminate gingivitis in its early stages. Don’t be fooled by those who say an herbal mouthwash can get the job done. The Journal of Dental Hygiene’s study “Antiseptic Mouth Rinses: An Update on Comparative Effectiveness, Risks, and Recommendations” concludes that “research supports the effectiveness of antiseptic mouth rinses in reducing plaque and gingivitis as an adjunct to home care.” An additional study from the same journal found that an herbal oral rinse was no better than the placebo in a study comparing antiseptic mouthwash to herbal. PrecisionNutrition.com lists probiotics, cranberries, and green tea as foods to help combat gingivitis. They all help reduce the populations of harmful bacteria. Livestrong.com suggests nuts, fatty fish, citrus fruits, and leafy green vegetables to help dental health and end gingivitis. Finally, that twice-a-year dental visit for a professional cleaning can be a critical to people who battle chronic gingivitis. It’s money and time well spent compared to undergoing the serious complications of out-of-control gingivitis. add, bacteria, birth control, bone, bone loss, carrots, dangers, dangers of tooth infection, dental health, dental procedures, dentures, diabetes, diet, floss, food, gingivitis, green tea, health, heart disease, immune system, increases your risk, infection, inflammation, medical news, milk, nuts, pain, peppermint, probiotics, smoking, stress, tooth pain, turmeric, vegetables, vitamin, vitamin c, yogurt.